Spring might be around the corner, but February can still bring plenty of harsh winter weather. Some of the harshest of the season, in fact. So that makes this month the perfect time to knock out some more of those indoor tasks to get your home ready for warmer times. “I’ve been doing indoor tasks for three months now! Dear God, please let me out!” you’re no doubt drying. Have patience, young grasshopper—we’re almost there. But first you have to prepare your home for spring by thinking “fresh.” A fresh house can help combat the cabin fever that can overwhelm you in the last month of winter. So how do you get fresh? We’re glad you asked! We’ve created a handy checklist of home maintenance tasks to give your home a lift in February. And if you’re struggling to muster up the energy to tackle these chores, we’ve provided tips for how to do them faster and easier—or with the help of a pro. Check these to-do items off your list, then sit back and relax for the last few weeks of winter. Task: Freshen indoor paint on walls, cabinets, doors, and trim. Shortcuts: Sometimes a once-over with a Magic Eraser sponge will remove marks and smudges, reducing the need for a paint job. 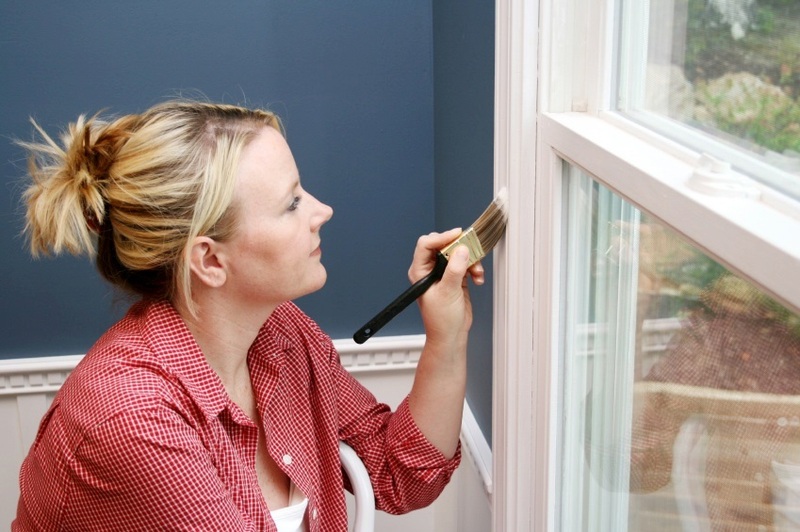 If that won’t cut it—and you need to paint indoors in February—stir a tablespoon of clear vanilla extract into the paint can to make the smell less obnoxious. And if you have trouble removing painter’s tape from furniture or walls, heat it briefly with a hair dryer. Call in the pros: A painter will charge $200 to $400 for a 12-foot-square room. Since spring is the busy season for painters, you may get a discount if you hire one at the end of winter. That means now! Task: Clean and reorganize your laundry room so it’s roomier and more efficient. Scrape dried-on laundry detergent from ridges in your washer, replace damaged sorting bins, throw away laundry products you never use, and store the rest in out-of-reach places to protect young ones. Shortcuts: Take advantage of every square inch of laundry room space. If you don’t have room for a drying rack, extend a curtain rod over your machines to hang delicate clothes, and insert a “slim cart” between your washer and dryer to hold cleaning supplies. Also, try storing bins, buckets, and laundry bags on wall hooks to free up space. Call in the pros: A professional home organizer costs $30 to $80 an hour. While the organizer is rearranging your closets, ask her to work her magic on the laundry area, too. Task: Clean the duct that connects the back of your dryer to outside vents. If you don’t, lint and other debris could decrease your dryer’s efficiency, increase energy bills, and even cause fires. Also, make sure birds and other animals haven’t made a home in your warm and toasty vent. Shortcuts: Twice a year, use a leaf blower to remove lint and debris from ducts. Also, cover the outside vents with a fine mesh screen so birds and bugs don’t nest in ducts. Call in the pros: On average, a professional will charge $92 to $162 to clean dryer vents and remove clogs. If clogged vents are a persistent problem, the pro may recommend moving your dryer to an external wall where the distance between dryer and the outside vent is minimized. Task: To keep your refrigerator in tiptop shape and save energy, clean the refrigerator condenser coils located in the back or on the bottom of the appliance. Shortcuts: Use a vacuum to clean coils (just make sure to pop on the upholstery attachment first). While you’re at it, vacuum the floor under and behind the fridge, too. Then, shove a duster or refrigerator coil brush (about $5 and designed for this exact purpose) between the coils, and clean the rest of the dust, hair, and dirt still clinging to the coils. Call in the pros: The average cost to repair a refrigerator is $200 to $400. If the appliance is near the end of its life, typically 14 to 17 years, replace it. Task: Clean out your sump pump pit and make sure the sump pump is working in February to prepare for the increase in groundwater that spring rains will cause. Shortcuts: Test the pump by adding water to the pit, and confirm the pump ejects it as it is designed to, says home maintenance expert Charlie Frattini, who’s appeared on FYI network’s “Hero House.” Just be sure to replace the pit cover after confirming the pump works, he notes. Also, make sure nothing obstructs the sump pump pipe, which drains water to the outside of your home. Call in the pros: Labor to replace an existing sump pump costs anywhere from $40 to $150. Task: Vacuum box springs and the mattress top and bottom. Rotate or flip the mattress. Shortcuts: If you have a one-sided mattress—one side is padded; the other isn’t—don’t bother flipping; just rotate it to provide even aging. If you have a two-sided mattress, flip every two months to prevent sags. Call in the pros: A cleaning service will provide this type of deep cleaning for $25 to $35 an hour. Task: Inspect your roof for missing shingles and damaged vent boots, and check your foundations for cracks that can cause big problems when spring rains pour on your home. Shortcut: Wait until it rains, then climb into your attic to look for leaks. Call in the pros: Roofing and foundation waterproofing companies can inspect and cure water problems. A roofing company will inspect your roof for free if it replaces shingles and repairs other roof damage. Costs typically range from $100 to $350 to replace 10 square feet of asphalt shingles. Waterproofing companies can spray a sealant on foundation cracks for $250 to $1,000.